8 oz draft pour in a snifter. Deep amber color with a half inch head that dies down. Nose is easily the best part of the beer with carmrl,malt and bourbon popping. Taste is similar l. This beer still has some heat even with age. Good heat though. Maybe the best barley wine I've tasted. This is a must drink for barley wine lovers. Just a notch below KH, but it's close! Well done! Pours a dark chocolate brown color with subtle purplish hues and dark mahogany edges. Half finger light beige head that quickly settles into a thin, lasting ring. Spotty lacing left behind. Very inviting aroma with excellent barrel character that's nicely integrated into the leathery malts and vinous fruits of the base beer. Some softly charred oak, spicy spirit(with actuall pappy character), toasted coconut and silky vanilla bean. Underneath, there's a nice balance of vinous fruit and softly smoked leathery/tobacco-like malts. Hints of caramel drizzled raisin, date and fig along with toffee, tobacco and musty leather. Smells amazing! Viscous full body with prominent barrel flavors nicely integrated into the Barleywine notes of the base. Dry toasted oak but not too powerful or acrid. Heavy dose of sweet, spicy spirit that actually has complex whiskey character. Great fiery heat but not harsh or overly boozy with cinnamon and toasted coconut on the exhale. The vinous fruit and malt sweetness isn't as stong as in the aroma but is still there with caramel, raisin, fig and molasses. Subtle leathery tobacco but the earthy Barleywine flavors are slightly overpowered by all the spirit. Another solid entry in this series from Voodoo. From 03/14/15 notes. Big thanks to BeerLawyer85 for sharing this; thanks Ross. 22 oz. bottle into a taster glass. Pours a murky medium brown color with a few bubbles and no real head. Lots of sweet dark fruits, figs, delicious sweet bourbon, toasted malts, toffee, and caramel malts. Super smooth and very good. Well worth it. On tap at Voodoo Homestead in Homestead, PA. Got two pours of this one. Pours a moderately dark amber, with a spotty quarter inch head, and a little bit of lacing. Smells richly of deep malt and bourbon- the bourbon is huge on this one. I can't really tell that it's Pappy, because I'm not well-versed in it, but I do know that the bourbon smells nice. I also get aromas of vanilla, coconut, caramel, toffee, and tobacco. This is a wonderful barrel-aged barleywine. I've heard reports that it's falling off a bit at this point. Those reports seem to be exaggerated, or they're just about the bottles at this point. There's a big amount of sweet malt and grain up front, some honey, molasses, brown sugar, toffee, and some leafy tobacco bitterness near the end. This is pretty thick bodied, with a syrupy, and very full mouthfeel, along with a lower level of carbonation. 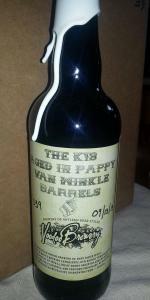 One of the best barleywines ever. A really impressive achievement. A bit of a thin and wispy burnt caramel color in the glass with a bit of carb. The smell is powerfully boozy with all the typical hits of a strong bourbon. Mouthfeel is a bit thin at this ABV and the finish is hot despite the age. Caramel, toffee, vanilla, and coconut finish are the flavors I get. The beer is a vehicle for the barrel in this case, and I think that's just fine. Very complex and interesting beer for the bourbon drinker. This was a fantastic BA barleywine. So much taste going on while still being amazingly balanced and enjoyable. I would love for this beer to make another return.